A Lass Of Yesteryear: Swim Time! It's been a great month so far, and I haven't been at my sewing machine as much as usual. I've done a lot of "small" projects, like altering bridesmaid and flower girl dresses for my friend's wedding this weekend, hemming the pocket-squares for the guys, sewing on a button, or a hook and eye. Nothing really big. But since it's summer, that means I'll be swimming, and I needed a new swim top. So one afternoon, I made up the pattern, and the next afternoon I sewed most of it. 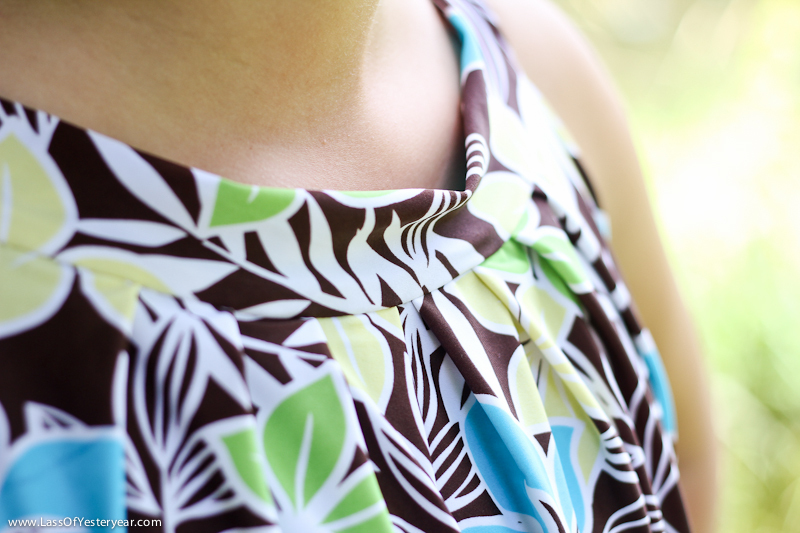 Here you can see the pleat detail on the neckline - the pleats are mirrored at the waistband. Okay...Anne of Green Gables AND a 1920s beaded gown??? That's sounds exciting- I can't wait! So cute! Yeah swimming material is So hard to sew, thenks for the tip! Hayden - I'm pretty excited myself! :) Thanks! Isabella - Thank you for the comment! Like the idea of the two layered top . . . good thinking. Love this swim top!!! It's super cute.